I love the idea of grilling shrimp, but on most days it can be a little tricky. This recipe is no mess, no skewers, all in a convenient foil pack cooked on the grill in like 5 minutes! This is a great recipe for the upcoming tailgating and football parties. I have to admit, I am not the biggest sports fan, but I do excited about the cooking part of it all. Combine all of the ingredients in a bowl, minus the shrimp. Stir well to combine, taste for salt. 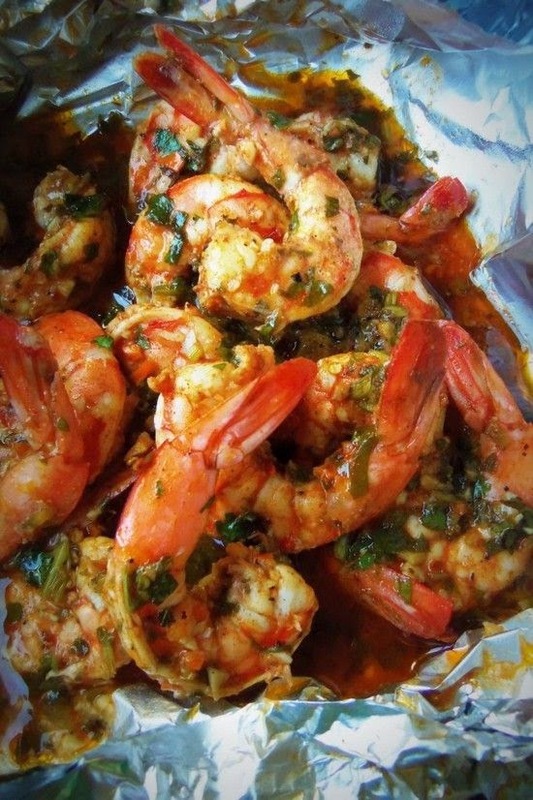 Add in the shrimp and marinate in refrigerator for 45 minutes, no more than 1 hour. Preheat grill to medium heat for 10 to 15 minutes, about 325ºF. I have a charcoal grill. Remove shrimp from refrigerator 20 minutes before cooking. Divide the shrimp, including the marinade into two foil packets, seal shut. Cook on grill with lid closed for 5 to 7 minutes, checking after 5 minutes. Remove from grill and let sit for 5 minutes before serving. Yields up to 4 servings as an appetizer. Notes: Serve with sliced baguette for soaking up broth or warm tortillas and salsa.